The deadline for abstracts has been extended. The Forty-fourth Annual Byzantine Studies Conference (BSC) will be held in San Antonio, Texas, from Thursday evening, October 4th through Sunday afternoon, October 7th. For information on BSANA, please consult the BSANA website, http://www.bsana.net; for details on the conference, please consult the 2018 BSC website, https://www.bsc2018.com/, which will be further updated as new information becomes available. 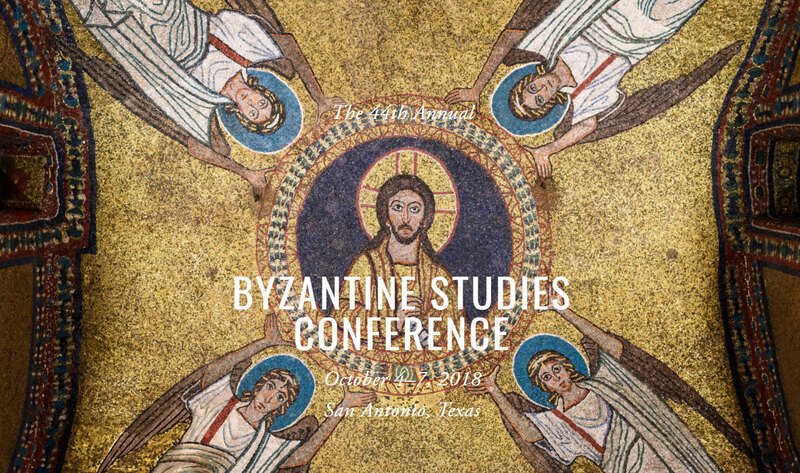 The BSC is the annual forum for the presentation and discussion of papers on every aspect of Byzantine Studies, and is open to all, regardless of nationality or academic status. It is also the occasion of the annual meeting of the Byzantine Studies Association of North America (BSANA), conducted by its officers. We welcome proposals on any aspect of Byzantine studies. 2. A single PDF copy of the 500-word or less, blind abstract (title only, no name), formatted and submitted according to the detailed instructions below. All abstracts, including those in proposed panels, will be reviewed by each member of the Program Committee and will be accepted on their own merits. Please note that this review is anonymous; all personal information is removed before the abstracts are read. Your anonymous abstract is the sole basis for judging your proposed paper for acceptance. Please keep in mind that all of the readers of your abstract, the eight members of the program committee, are unlikely to have in-depth knowledge of your specific topic of research, or of your general area of study. As indicated above, the areas of expertise of committee members range across several disciplines. One or more of these readers are unlikely to be expert in the chronological period with which you are dealing, or the historiographic or special issues involved in your field of scholarship. Thus your abstract should introduce your topic for presentation, including the significance of your work, the argument you are making, and the conclusions you propose, to an educated reader well-versed in Byzantine Studies writ large, but who is not an expert in your own subject. For the conference, the 2018 BSC program chair will group papers into sessions, with the expectation that many sessions will be interdisciplinary. The session topics in the final program will depend on the subjects represented in accepted the submissions. The abstract should be no more than 500 words in length and should indicate the paper’s original contribution in sufficient detail and with some indication of the contributor’s conclusions so that the Program Committee can assess its merits. All proposed papers must be substantially original and never have been published or presented previously in a public forum. Each contributor may deliver only one paper. The Program Committee may give preference to those who did not present a paper at the last BSC. We accept abstracts and papers in English or French. Organized panels may also be proposed; see instructions below. If accepted, the abstract will be published in the Byzantine Studies Conference’s annual Abstracts of Papers. Submission of the accepted abstract for publication constitutes agreement to present the paper at the conference. Follow the Instructions for Preparation of the Abstract to facilitate its publication. BSANA has no paid staff; failure to prepare the abstract carefully will make it impossible to publish. For inquiries on the results of the review process, please contact the 2018 BSC Program Chair, Benjamin DeLee ([email protected]). BSANA is using for the second time an online submission method: Easy Chair, a free software used across the globe by over 50,000 conferences and universities to date, especially in the fields of science and technology. The abstract will now be submitted with title only (a blind abstract) and must be uploaded as a PDF file. Detailed instructions for uploading your abstract are provided on the conference website, under “Call for Papers”. BSANA Vice President Jennifer Ball ([email protected]) will oversee the submission process and will confirm receipt of your submission. The PDF submission format is designed to avoid problems arising from the use of different Greek fonts. Alphabets other than Greek should be transliterated. The submission of a proposal and its acceptance represents a commitment from the contributor to read the paper in person at the BSC. Those who cannot attend must withdraw no later than June 1st. Failure to notify the Program Committee in a timely fashion will adversely affect future chances to present at the BSC. To deliver your paper at the BSC, you must be a member of BSANA in good standing. If a speaker is not a member in good standing by the date of the conference, she/he will not be permitted to present. To join or renew membership, consult the website: http://www.bsana.net. • The maximum word count for this abstract is 500 words. • Your document must be composed in Microsoft Word, and saved in final form as a PDF. • Margins: one inch at the top and bottom, 0.75 inches at each side. • Font: Times New Roman, 12 point. • Line Spacing: Single spaced. • The title line(s) must be in Boldface, centered at the top of the page. • Titles may not be longer than two lines. • Capitalize only the first letters of words in the title. • Do not put your title in quotation marks or underline your title. • Skip one line (i.e., double space) before the first line of the body of the abstract. • If your paper is a study based on a particular manuscript, consider citing the MS in your abstract title as a help to scholars when they search our abstracts for previous studies of MSS. • Please follow the Bulletin Codicologique convention for proper citation of manuscripts (in abstract titles or in the body of your abstract). • Please write your abstract text flush left; do not use the right-hand margin justification. • Indent first lines of each paragraph five spaces. • Leave one empty line between paragraphs. • Do not use footnotes. If you need to include a citation, put it within your text in parentheses. • Please do NOT use the future tense (“This paper will investigate…”). Your abstract may be edited for grammar and stylistic consistency to remove the future tense. • Italicize titles and words in foreign languages. • Quotations and titles in foreign alphabets other than Greek should be transliterated. • Avoid using tables or diagrams in the abstract. Photographs cannot be reproduced. The BSC welcomes proposals for whole panels. Each paper author prepares an individual abstract and submits her/his abstract, selecting the pull-down menu online for organized panel, and providing panel title, organizer, and panel summary. The panel summary will include a summary of the overall topic, the format for the panel (such as a debate, papers followed by a discussion, or a traditional session of papers), and the reasons for covering this topic as a prearranged, whole session. This should be no longer than 300 words. The organizer may also propose a session chair; please note that the session chair cannot also be a speaker in the panel. The Program Committee shall first decide whether to accept or reject each panel proposal in its entirety based on its summary and contents. Then each paper will be evaluated according to the regular anonymous evaluation procedure established by the BSC. Inthe event that most but not all the papers in the panel are accepted, the Program Committee will alert the organizer and will make every effort to keep the remaining papers together. All participants in the panel (organizer as well as speakers) will be notified of the proposal’s receipt by BSANA Vice President Jennifer Ball, and notice of the Program Committee’s final decision will be made in the usual way.